Quite striking is the similarity between the warm response to Pope John XXIII half a century ago and to Pope Francis today. Both aroused enormous interest and broke through the gilded cage of outdated conventions and stereotyped expectations. Both stepped over barriers of ideology or religion to evoke bonds of a common humanity committed to promoting the wellbeing of all people, especially the poor and marginalised. The contexts were of course quite different. The avuncular John became pope following the slow decline of the war-time pope, Pius XII, when the Cold War was at its height. As Peter Hebblethwaite described in his wonderful 1984 biography, John XIII: Pope of the Council, John played a role in allowing Soviet Premier Khrushchev to back down during the Cuban Missile Crisis in October 1962. Francis on the other hand comes from a developing country with acute problems of poverty and injustice. He lived through the 'dirty war' in Argentina, when 30,000 people were killed, including 150 priests, and even nuns. Because of his close involvement with slum dwellers, he was appalled at the workings of the international economy that tolerates such widespread social injustice and inequality. He is particularly critical of the GFC, and calls for thorough-going economic reforms to ensure outcomes are socially just and equitable. Yet it was John XXIII who was the first pope to focus detailed attention on issues of world development, in his 1961 encyclical, Mater et Magistra. He was writing following the rebuilding of western Europe with the aid of the Marshall Plan, and when there was renewed optimism that such rapid development could transform poorer countries. The Alliance for Progress between the United States and Latin America was under way. These promising hopes were greatly undermined by the Cold War struggles and political movements in many developing countries, and the world soon teetered on the brink of nuclear war. John initiated the Second Vatican Council in 1962, and was guiding it to engage more strongly with these great social issues of the day. He was alert to the issues of war and peace and, when he realised he was dying, issued an encyclical on peace, Pacem in Terris, encapsulating his views and setting markers for the Council to follow. He had been a stretcher bearer during the First World War, so knew the carnage and slaughter of war, with the immense toll of human suffering and the consequences for families and nations. Yet as a committed anti-Fascist, the Vatican diplomatic service had later kept him posted out of Italy and harm's way in Bulgaria and Istanbul. Here he learned to experience the other worlds of Orthodox Christianity and life in an Islamic country. He recognised the values of people in other religious traditions, and the need for the Catholic Church to work more closely with them to preserve the common good of all peoples. He wanted the Council to encourage this wider cultural dialogue across religious and ideological barriers. 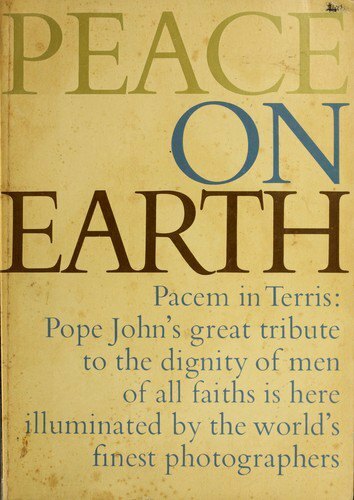 Pacem in Terris was drafted by Mgr Pietro Pavan, a discipline of the political thinker, Jacques Maritain, and signed by Pope John on 11 April 1963. It also drew from the writings of the 'New Theology' that spread before and after the war, insisting that the Church relate much more closely with the world of work and society, and abandon its Counter-Reformation fortifications. The new encyclical caused a sensation internationally. It encapsulated beautifully how intently the Church was committed to promoting peace and human rights, and baptised John's expansive engagement with the world's social and political problems. As well as appealing for peace and cooperation among peoples, Pacem in Terris was an appeal to people everywhere, deeply shaken by the near disaster of nuclear war, that peace required dialogue across Cold War boundaries, and practical collaboration through international organisations to promote human wellbeing. Pope John said the Church needed to build bridges even with the Communist world, to help defend the rights of religious believers and to develop dialogue between different political systems and ideologies. John believed failure to relieve tensions and create better understanding would likely result eventually in another frightful war. His encouragement of careful and astute dialogue with the Communist world aroused strong opposition among more strident anti-Communists, some of whom felt betrayed. John died on 3 June 1963, less than two months after Pacem in Terris, yet his encyclical had a major influence on the Council and on Pope Paul VI, and helped make possible the advances in the documents on religious liberty and especially the landmark Church in the Modern World. Like Francis, John XXIII faced opposition by more conservative people in the Vatican Curia and beyond. But he was determined to lead the Church forward, gently but firmly, opening Catholics to fresh ways of recognising the good in every person, in cultures and other religious traditions. Francis is endeavouring to follow a like path, though this time in the context of competing forms of capitalism struggling to manage gross inequalities in living standards and life opportunities, at the same time as global warming dangerously threatens a sustainable future for the human race. Bruce Duncan is a Redemptorist priest who lectures at Yarra Theological Union in Melbourne. He is director of the Yarra Institute for Religion and Social Policy within the University of Divinity. The canonisation of John XXIII and John Paul II will take place this Sunday 27 April 2014. J23 last words on his deathbed, as reported by Jean Guitton, the only Catholic layman to serve as a peritus at the Council, were: "Stop the Council; stop the Council." Jean Guitton was not a lay 'peritus' at the Council and, as for his assertion about John XXIII' alleged words on his death bed, you lifted this nonsense out of the sede-vacantist rag, The Remnant and even they admit that Guitton's 'revelation' is a figment of his imagination. The assertion that JPII was the decisive factor in 'bringing down' the Communist bloc belongs not to history but to hagiography. The historical reality is that the Reagan administration and those before him literally outspent the Russians and their satellites. John XXIII and Paul VI with their hard nose, enlightened understanding of the communist mind expressed itself in an Ost-politik which was proactive and effective. So too their combine magisterium on free market Capitalism, its effects on the third world and the erosion of social, economic and religious justice. John Paul II was simply reactive and stubbornly just as doctrinaire and dictatorial as his interlocutors. History will discount his lasting value in the peace and harshly judge his moral weakness in sacrificing the Latin American bishops like Romero in return for supporting US political and economic containment of the Soviet bloc and their empire building in the third word. Mechanically cutting and pasting someone else's script is no substitute for independent thought, John George. Mr Timbs places the Soviet conflagration before the initial papal spark! Timothy Garton Ash Professor of European Studies at Oxford University. corroborates the Gorbachev evaluation: "Without the Pope, no Solidarity. Without Solidarity, no Gorbachev. Without Gorbachev, no fall of Communism." Gorbachev was not the sole in situ exegete of the Soviet debacle. Millions of people spread the revolution, but it began with the Pope's trip home in 1979. As General Jaruzelski said, "That was the detonator." I write to defend Cardinal Pell in the wake of Elizabeth Farrelly's claim in the Fairfax press that Pell, when appearing before Justice McClellan at the Royal Commission, proposed a 'priestly child abuse insurance scheme'. Pell is not one of my fans, and neither am I one of his. But I think Farrelly has unfairly kicked him when he is down, and muddied the waters about what is a critical issue for the victims of child sexual abuse.